Soon after the latest Star Wars movie came out, Sphero introduced its model of the BB-8 robot. Soon afterward people were taking it apart to see how it worked. A few people started posting DIY projects trying to build a “working” BB-8 robot. I decided to try my hand at building a “working” BB8 as well. Starting in January with the goal of being ready for PortCon (Portland, ME ) in June. There are three primary methods for constructing the sphere. 3D print various panels and then assemble them to form a sphere. Reading what others have said about this process its not simple. Because of the size of the panels and their complexity this is a difficult process. Besides being expensive its hard on the printer. A number of people report having to repair or replace their printers. Construct a sphere from a material such as fiber glass. This started out to be the common method most people used. An early DIY project made this seem much simpler than it really is. This method involves covering a ball,beach or yoga, with a paper/canvas mache mixture. The BB8 community decided that the body is about 20 cm in diameter. The ball in the DIY project is not that big. As it turns out, finding a beach ball in Maine in January is impossible. So it was off to Amazon. First attempt with paper and canvas, following the DIY project. Clearly this was not going to work. I decided to use fiber glass instead of canvas. I also found a 20 cm ball at a party store. Despite the drive train issues, BB8 still spoke and the light worked. So it was off to the con. I started over with new motors, frame and servos. So far its looking a lot better. Two videos before this all gets put back in the ball for a test run.. The first step was to learn more about the group. There are currently four members but for most of their albums there were five. Harry Stiles, Niall, Liam, Zayn and Louis.They have released five albums, Four, Take me home, Up all night, Midnight memories and Made in the A.M. With the help of my daughter we found a site that had the lryics to all of the songs. What I found was that while some of the song files contained information about who was singing what section, many did not. I was hoping that maybe the sentiment could be aided by knowing the singer. Maybe Harry always sings sad/ break up songs(he did date Taylor Swift). Since this information isn’t consistent I couldn’t count on it. I felt it was important to have the ability to track lyrics by location in the song, row and column. 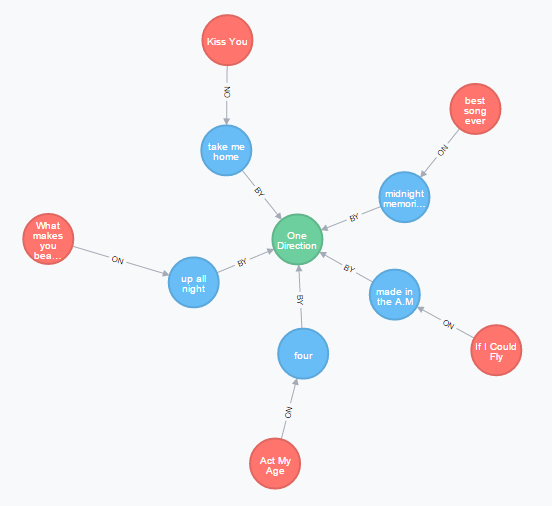 This way one could query “what words appear the most often at the start(0,0) of a song? How often do certain word combinations( “I” and “you”) appear on the same line? This last question could be useful in better understanding sentiment? 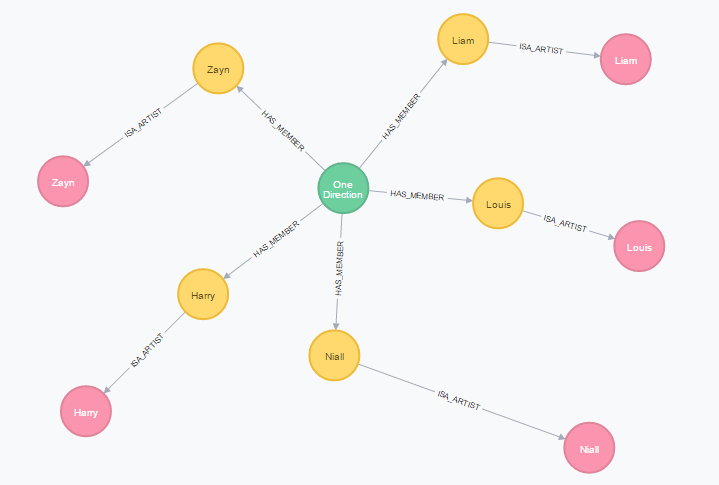 Tools: Python, py2neo, R and RNeo4j. 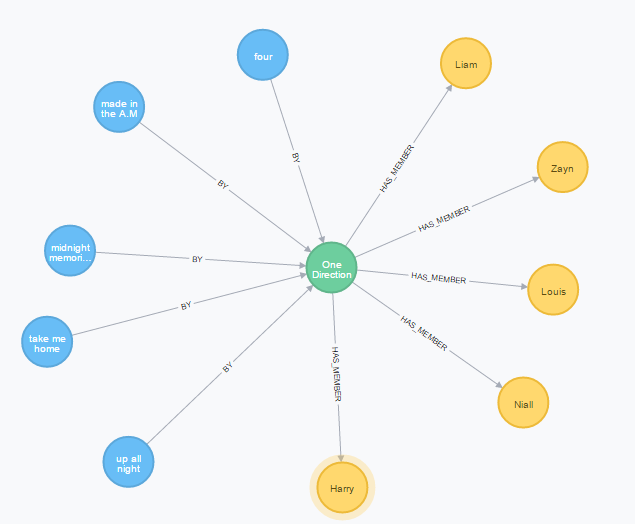 I decided that a Group node would refer to a band or singer. A group would be made up of members and members were artists. For bands this is fine. I made the choice to treat single acts the same as way. So Lady Gaga or Taylor Swift would be a considered a group,member and artist. For the gist I restricted the data to one song per album and reduced the lyrics by two thirds. Even with this there are still 581 lyric nodes. There are 232 unique words. The difference is due to words being repeated but in different locations. The word “you” is found 28 times in the five songs. Show all lyrics in Act My Age. Show all songs on all of the albums. For the gist there is only one song per album. Show all of the lryics for the song “Kiss you”. There are some connections of lryics to other songs. This is becuase those lryics are used in the same location. The lryic “Baby” is used in “Kiss Me” and “What makes you beautiful” in the same row and column. A query to find songs where the words ‘I’ and “you” are on the same line. The query works well in Python since I can filter out return values of 0. This type of search will be help when looking for phrases, words on the same line. 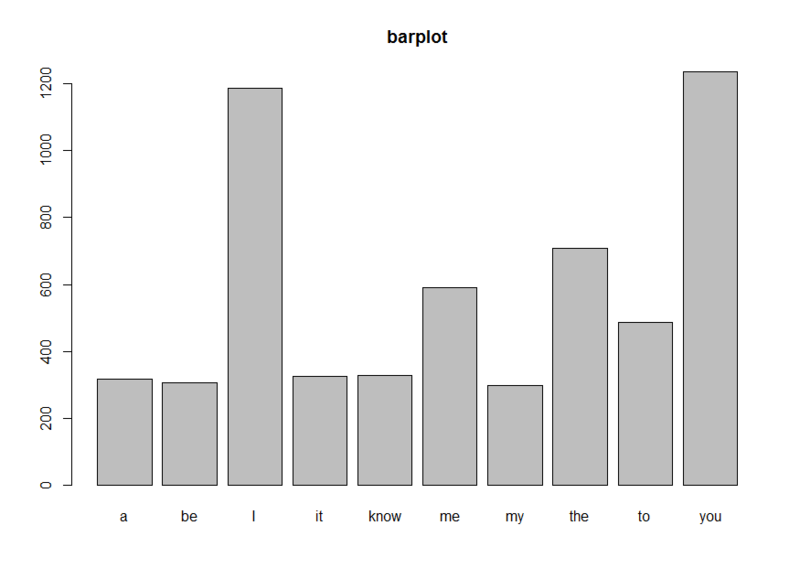 Below is a bar chart of the top ten most common lyrics. “I” and “you” are popular. Sentiment The last thing to consider is sentiment. Using the simple process of positive and negative words I’d like to see if one make a determination of sentiment. There isn’t a song word list that I could find so I elected to use the AFINN list. Following examples from Jeffrey Breen and Andy Bromberg I was able to get some results. I didn’t divide the songs up into training and test sets, instead I picked two songs and processed them. My daughter suggested that “Best Song Ever” would be happy and “If I could Fly” would be sad. This returned a list of lryics. Next I counted the number of lyrics that matched a positive or negative word in the AFINN list. I classified the words into “reg”, scale 1-3 and “very” scale 4-5 for both positive and neg. Using R functions naiveBayes() and predict(). The method is very simple but the results do follow that Best Song Ever “happier” then If I Could Fly. It would be good to get One Directions opinion on this. One thing I noticed is that simple word matching isn’t sufficient.For movie reviews or emails this may work. Song are more complex. Example. A happy song might have the line “I love you” while a sad song might have a line “I used to love you”. Both have the positive word “love” in them but the second line could be viewed as sad, love lost. This is where querying lyrics on the same line could help. Its more complex than matching positive and negative words. Conclusion This was fun and I got a little Father daughter time in as well. I’d like to pursue this to see what can be done by considering phrases and connected words. Like a lot of people I grew up with video games. But these were quit different from what we have today. Space invaders, Lunar lander, Missile Command and Asteroids look like cave drawings when compared to what is available today. I have experimented with tools like LightWave and Maya but their costs are prohibitive and they are not really suited for amateur game developers. Unity 3D, on the other hand, is ideally suited for those just getting started with game development. In addition, it can easily support more complex professional games. Their recent announcement for free support for mobile applications means its time for me to make the leap. A modern game typically requires a lot of people, mainly artists, to create scenes and characters. I can use tools such as Blender but I am not nearly proficient enough to build the images as well as create the game. I need a game where I can leverage existing art work and just focus on the mechanics of the game and learning Unity. What I need is a 2D side scrolling space game. I decided on trying to replicate the Lunar Lander game. It won’t be an exact match but instead more updated and something that fits with the Unity model. Look around in the Apple and Google app stores and you can find a number of these games. Some are 2D while others are 3D and much more realistic. I am not trying to be the next “Flappy Bird” so I don’t expect to compete with other games. Its all about the learning. The point of game is to land the ship on the surface before you run out fuel and crash. In the earlier games the ship would rotate as well as translate. Correcting the rotation makes the game much more difficult to play. For this version I’ll stick with simple translation left, right, up and down. Of course there needs to be a surface to land on. A simple flat surface is boring. Adding some sort of obstacles will make it a bit more challenging. Unity can import models from many tools such as Blender and Max 3D. For a mobile game the model can not be too complex. The more detailed the poorer the game performance will be. I found a reasonably sized lunar lander model from NASA that is free to use. In the original game the surface changed from flat to mountains. I decided to add rocks to a flat surface. In order to make things a bit more complex I added the rocks at random locations and sizes. The rocks provide obstacles to avoid but there needs to be a ‘safe’ landing place. These are marked ‘green’ so the player can be seen. Since the rocks are randomly placed the landing places need to be adjusted as well. The process is to place a landing spot and then place the rocks. The code has to make sure the rocks are not covering the landing place and that there is enough room for the lander. Find the game object tagged GUI so that we can determine the player’s level. The landing pads are adjusted differently once the player is beyond level one. Create the landing pads by varying the “x” value. Create a 1000 rocks. Each rock is generated in a random x location. The height of each rock is also random( y direction). The game is 2D but I am using Unity in 3D mode. For creating the rocks I am creating a 3D field. At some point I may change the game to be more 3D. Each rock is check to make sure that it doesn’t overlap with a landing pad. I didn’t want the code to get stuck in the overlap process so after 10 tries I give up. Since the game has more than one or two controls it requires the addition of buttons. Keyboard controls are not an options and multi-touch is complicated. I need to control the main engine(up), left and right thrusters and a pause button. A ParticleEmitter is used to indicate engine or thruster action. // adjust the upward velocity the further away from the ground. The assumption is that the planet has gravity. I have left the gravity setting standard as Unity sets it. The term Time.deltaTime increments the fuel usage according to the FixedUpdate() rate. It is standard in Unity to do this when doing something in the fixed update call. There are two ways to fail a landing. One is to land on rocks. The other is to land too fast. A vertical velocity indicator turns red when the ship is landing too fast. When the ship touches the landing pad the velocity is checked. The function OnCollisionEnter() is called when two objects touch. In this case it will be the ship and either a landing pad or a rock. setting Time.timeScale to zero stops the game play. the GUI.guiMode is set to either win or lose. This will cause the correct screen to be displayed and the score to be adjusted. Since this is a mobile game there needs to be buttons for the player. A single touch would work if it was to run the lander engine. Left and right translations are harder. Touch to the left of the lander could go left and the same for right. Since the lander moves it could move under the touch point and cause the movement to change. Buttons just seem easier. Unfortunately Unity’s UI is not straight forward.The placement and operation of a button is pretty simple. Buttons are GUITexture components. Getting the position and sizing correct for different size devices is a challenge. There is talk that future versions of Unity will have better UI tools. In the FixedUpDate function I test each button. Scoring is pretty straight forward. Land successfully and you get a point and proceed to the next level. Crash and you have to repeat the level. At each level the landing spots get harder to find. As the level increases I need to increase the fuel(or lower the rate at which its is used). Sound is handled from an AudioSource component. This plays the sound once. As long as the button is held down the sound will be played over and over. Playing the sound in a loop is possible for something like background music. For sounds like the engine or thrusters I need short burst of sound. The ship approaching a landing pad. The vertical velocity is in white and positive. This indicates that the ship is moving up at rate within the range for landing. Since the landing pads are randomly placed I found it hard to locate them and no run out of fuel. I added a overhead view in the upper right corner to guide the player towards a landing pad. The left corner shows the fuel and velocity levels. The ship over the rocks. The vertical velocity is in red and negative. This indicates that the ship is moving down at rate too large to land. I decided to put the game on Goggle Play just to see how this process works. Update: I see one person has complained that at a high level you just crash into the rocks. It could be that this is a fuel issue. The landing pads are too far away for the fuel usage rate. Once I get the iOS version to work I’ll put it on the Apple Store as well. back to the jobs data.. The task is to query the system each and store the results. The goal is to have sufficient data to process through a Hadoop/Spark process and perform text analysis. Many of the postings, especially from agencies, are duplicates. I want to see how well one could match job posting using Spark machine learning clustering. to do some spatial analysis. The API for the job site lets you filter by keyword, state, city, date and employer or employer/agency. You can also limit the data returned each time. Using the ‘-‘ with a keyword will ignore listings that include that word. At this stage I want to ignore jobs from agencies and contract jobs. This is because many agencies post the same job and many ignore the location,i.e post jobs in MA that are located in CA. For the second part of this experiment I will change this to pick up all jobs and try to use to classification to identify similar jobs. Besides using the “-” to ignore keywords I am setting “as_not” to two agencies that I know to ignore. “sr” and “st” are set to try and avoid contract jobs and agencies. Each day(yes, I should set it up with cron to run) I run it. I convert the data into a Result object. It is probably over kill and I could simply skip this step and go right to the database. I really like the compactness of the object and it makes the code look cleaner. job key is from the api and has a unique constraint to avoid adding the same one again. That is the code. after a few false starts I have been able to get it run and gather about 16k listings. Below are some of the query results. I used Cypher’s RegEx to match on part of the job title. One of the goals is run Spark’s machine learning lib against the data. As a first test I will count the words in the job title. In order to determine if the process is working I counted the words in job titles for New Hampshire. Now I have something to compare to after the Spark processing. Another idea as part of my “A year with data” exploration. Anyone who has worked in a Scrum/Agile environment understands the pain involved with task estimation. Some of the methods include shirt sizes (S, M, L), the Fibonacci sequence (1, 2, 3, 5, 8. ), powers of 2 (1, 2, 4, 8) and even poker. Then there is the process of dealing with disparate estimates. One person gives an estimate of 2 and another suggests its 13 . After some discussion its agreed that the task is a 8. At the end of the sprint maybe it turns out that the task really was a 5. It would be useful,and interesting, to determine how well people do in their estimation. Is person A always under estimating? Person B is mostly spot on,…. This seems like a good candidate for Machine Learning, supervised learning to be more specific. I am not sure how many teams capture information from the estimation process but they should. The ‘training’ data consists of ten tasks, the estimates from each of the nine team members and actual value the task turned out to be. I choose the Fibonacci sequence as a method for estimates. Another piece of information that could be useful is the estimate the team agreed upon. That could be compared to the actual value as well. I decided not to do since it hides the interesting information of each team members estimate. By using each team members input we could determine which ones are contributing more or which ones are further off in their estimates. I am not going to try and explain Gradient Decent as there are others much better qualified to do the that. I found the Stanford Machine learning course to be the most useful. The downside is that the course used Octave and I want to use Python. There is a bit of a learning curve trying to make the change. Hopefully I have this figured out. The significant equations are below. The cost function J(θ) represents how well theta can predict the outcome. Where xj(i) represents each team member’s estimate for all of the task. x(i) represents the estimate(feature) vector of the training set. hθ(x(i)) is the predicted value. The math looks like this. The first step is to read the data. One thing to consider is the Normalization of the data. This is important when data values vary greatly. In this case the data is not all that different but its worth the effort to add this step. #add the x0 column and set all values to one. Next we define the learning rate alpha to be 0.15. The number of iterations is 150. Setting these two values will control how well the cost function converges. Set the initial values of theta to zero. Then convert the data into numpy arrays instead of python strutures. First calculate the prediction. Theta . estimates. Calculate the cost and record the cost. This last step will tell us if the process is decreasing or not. I tried different combinations of alpha and iterations just to see how this works. The data set is far too small to declare anything. The cases where the actual was high there is less data and the error is greater. In order to get more data I’ll have to make it up. Having worked in development for years( many) I know that people tend to follow a pattern when giving estimates. Also the type of task will dictate estimates. A UI task may seem simple to someone familiar with UI development. While a server/backend person may find a UI task daunting. In deciding how to create sample data I devised a scheme to give each team member a strength in skills, UI, database, and server. Also each member has a estimation rating. This defines how they tend to rates tasks, low, high, mix or random. Once I get this working I start over and see how this new data performs. Wow! two days in a row, good for me. Where to start… Probably with the data. 3. For each State get all cities. 4. For each State/City geocode the city. For each State and City get events. The code below gives examples of how to pull the data from the Tycho site. The key is assigned by them. I found some cases where there are ‘[‘ and ‘]’ characters is the data. Since I couldn’t determine what to do with this I simply skip it. I also check for commas and spaces which make parsing difficult. Finding cases or deaths is bit more complicated. The field ‘number’ represents the number of events for that period. The hardware. For the most part I just use a Windows laptop. I need to run Hadoop and Spark and since I use the laptop for work I need a different solution.Something that I can run without disruption . Hadoop is marketed as running on commodity hardware. Lets see. I have two old systems that I have installed Linux(Ubuntu) on. Also I installed Hadoop and a host of other support stuff. I need to get these set up as a cluster at some point. public health issues. Some guy named Snow figured this out in the 1850’s. The big data movement has made things like machine learning,R, NLP, Hadoop, Pandas and Spark popular. I have decided to spend the next year mucking about with a couple of data sets to get a better idea of what can and can’t be done. There are two data sets I plan to use(so far). The first is public health information assembled by Project Tycho, University of Pittsburgh . The project has gathered public health data for over a hundred years. It consists of events(cases or deaths) due to disease. Each event is associated with a State, City, Year, and Day of the year. I have added Lat and Lon for each City. The second set is being created each day(when I remember…). It involves pulling data from a job board using their api. This data is nice because it is changing every day. It also has a lot of free text that might be useful for NLP or classification. My day job involves Java. For this effort I’d like to stay with Python. There are some exceptions where Java might make more sense, loading large data sets, or Hadoop MapReduce. I am using Django to create web apps as needed. Python has it own analysis library, but works well with R. Probably a good path to stay with. 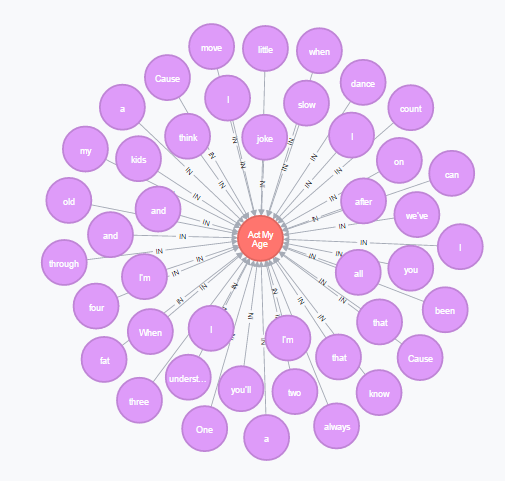 My favorite data store is Neo4j, the graph database.